From now on, your joy will debase and trample underfoot your repose, your sleep, and even your suffering. Remember that truth is not stable ground but the ceaseless movement that destroys all that you are and all that you see. You will not cease before you recognize yourself as a man who carries within him a hope great enough to demand all sacrifices. This Memento will remind you that from this moment you can no longer expect any peace from yourself. ☛ Georges Bataille’s Memento, March 1937. Reproduced in The Sacred Conspiracy. The internal papers of the Secret Society of Acéphale and lectures to the College of Sociology by Georges Bataille, illustrated by André Masson, edited and introduced by Marina Galletti & Alastair Brotchie, translated by Natasha Lehrer, John Harmann, Meyer Barash, London: Atlas Press, 2017, p. 175. The Sacred Conspiracy, London: Atlas Press, 2017, pp. 176-177. «Portefeuille destiné aux membres d’Acéphale [S.l., s.n., vers 1937]. Portefeuille à 3 rabats intérieurs de percaline jaune (18 x 13,7 cm). 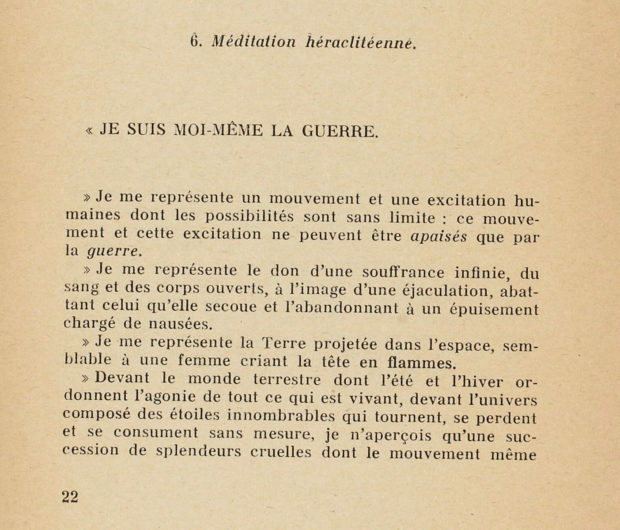 […] conçu par Georges Bataille pour les membres d’Acéphale, société secrète dont les membres se réunissaient au pied d’un arbre foudroyé de la forêt de Marly ou dans les ruines du château de la Montjoie. Le […] « memento » imprimé, avec 3 corrections manuscrites, contrecollé sur le premier contreplat. […] Une carte sommaire de la forêt de Marly, imprimée en noir sur une feuille volante glissée sous les rabats, accompagne le « memento ».» (captions and image retrieved from Artcurial). À partir de maintenant ta joie foulera au[x] pied[s] et avilira ton repos, ton sommeil et même tes souffrances. Souviens-toi que la vérité n’est pas le sol stable mais le mouvement sans trêve qui détruit tout ce que tu es et tout ce que tu [vo]is. Souviens-toi que la vérité est dans la guerre. Tu n’auras plus de cesse avant de t’être fait reconnaître comme un homme portant en lui un espoir assez grand pour exiger tous les sacrifices. Ce memento te représentera maintenant que tu n’as plus de paix à attendre de toi-même. Its [the memento] central tenet, that “in war is truth” [la vérité est dans la guerre], allies it with the philosophy of Heraclitus who elevated conflict to a cosmic principle that imposed its rule upon humanity. This text is also a sort of recollection of Bataille and Masson’s unforgettable “conversations of April” in Tossa de Mar in 1936, and thus of the second issue of Acéphale, “whose pages were like symbols of fire” at the Nietzschean festival where this pre-Socratic philosopher presided over the death of God. 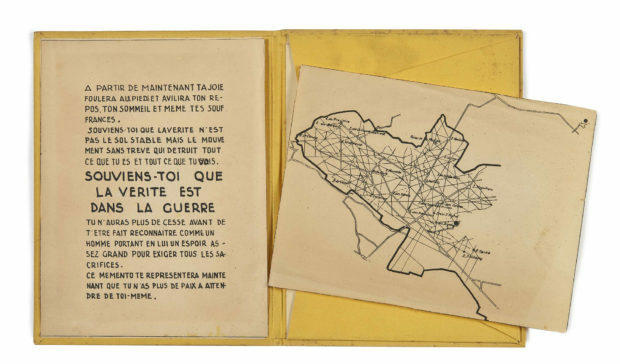 Included with the “Memento”, in a canvas folder for each member, was a map of the forest of Marly, which revealed the two sacred sites of Acéphale. The first of these was the stricken oak of Acéphale, which was probably the oak of Joyenval, at the edge of the “Étoile Mourante” (the Dying “Star”), as described in more detail in “Marly, Montjoie…” following. The second was the ruins of Montjoie, connected by the Gate of Joyenval to the abbey of the same name. Beyond that was the wall surrounding the ‘Désert de Retz’, an estate presided over by a chateau built in the form of “a truncated column” and with various other unusual buildings, including a pyramid and a small temple, which Bataille and his partner, Colette Peignot (Laure), found conducive to their nocturnal rituals. One of the main source for this information is Claudine Frank’s “Acéphale/Parsifal. Georges Bataille contra Wagner”, in Durkheim, the Durkheimians, and the Arts, ed. Eugene Jolas, A. Riley, W.S.F. Pickering and W.W. Miller, Durkheim Press/Berghahn Books, New York, 2013, p. 279. Its [the Memento] affirmation that “In War is Truth” allies it with the philosophy of Heraclitus, who was closely associated with Nietzsche in Acéphale 2, and was further evoked in a letter from Masson to Bataille as “the one who endorses all aspects of struggle and questioning whilst laying down an absolute challenge to everything associated with the idea of Being.” Heraclitus reappears in the later issues of the magazine as a cosmic principle that imposes his laws on everything else. 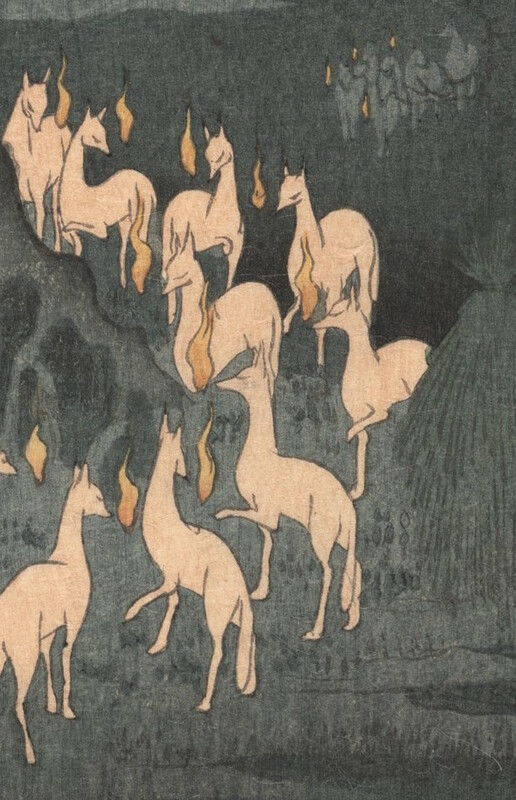 In issue 3/4 he presides over the mythical opposition between the Caesarean sky and the Dionysian earth in Bataille’s “Nietzschean Chronicle”, while in issue 5, the “Heraclitean Meditation”, brings to a close the mystical and initiatory exercises of joy in the face of death. Heraclitus reappears again in an aphorism in Bataille’s Anti-Christian’s Manual: “Heraclitism is the sensation of the earth trembling and the fall into empty space as felt in the Nietzschean experience of the death of God”. The opening of the essay “The Heraclitean Mediation” is well known: “I myself am war,” declares Bataille. The English translation is available in Visions of Excess: Selected Writings, 1927-1939 (U. of Minnesota Press, 1985, p. 239). The Original French version appears in Acéphale no. 5, in 1939, pp. 22-23 (available online). Father Christmas was hanged yesterday afternoon from the railings of Dijon Cathedral and burnt publicly in the precinct. This spectacular execution took place in the presence of several hundred Sunday school children. It was a decision made with the agreement of the clergy who had condemned Father Christmas as a usurper and heretic. He was accused of ‘paganizing’ the Christmas festival and installing himself like a cuckoo in the nest, claiming more and more space for himself. Above all he was blamed for infiltrating all the state schools from which the crib has been scrupulously banished. On Sunday, at three o’clock in the afternoon, the unfortunate fellow with the white beard, scapegoated like so many innocents before him, was executed by his accusers. They set fire to his beard and he vanished into smoke. 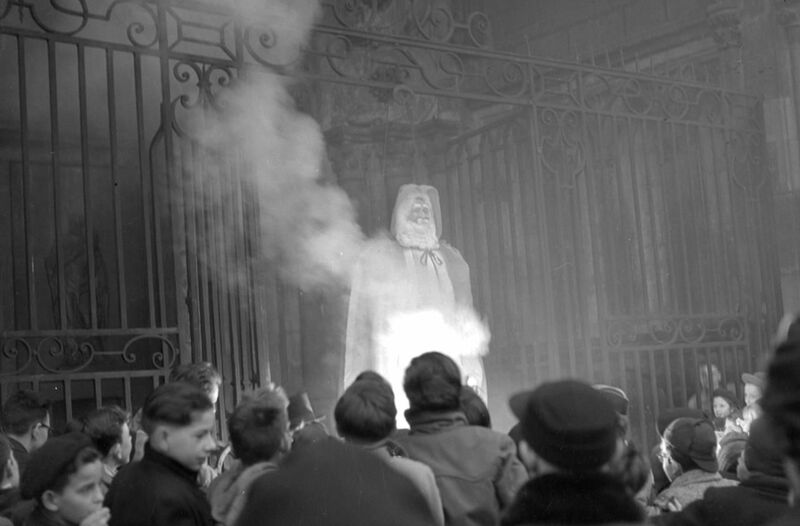 ☛ France-Soir, “Sunday School Children Witness Father Christmas Burnt in Dijon Cathedral Precinct,” December 24, 1951. Version française. The events described above1 are mentioned in an essay published by French anthropologist Claude Lévi-Strauss titled “Le Père Noël Supplicié”. This essay was first published in 1952, in the monthly journal Les Temps Modernes. It was later republished in Nous sommes tous des cannibales (2013). In 2016, it was published as a standalone book with the same title Le Père Noël supplicié. It was first translated into English by Diana Gittins in 1995 under the title “Father Christmas Executed” and was included in the collection Unwrapping Christmas, edited by Daniel Miller. To put things in perspective, The Elementary Structures of Kinship, one of Lévi-Strauss two doctoral thesis, was defended in 1948 and published the following year, in 1949. Tristes Tropiques –with its famous opening line: “I hate travelling and explorers”– was published in 1955, and the Structural Anthropology in 1958. […] it is a long way from the King of the Saturnalia to Father Christmas. Along the way an essential trait–maybe the most ancient–of the first seems to have been definitely lost. For, as Frazer showed, the King of the Saturnalia was himself the heir of an ancient prototype who, having enjoyed a month of unbridled excess, was solemnly sacrificed on the altar of God. Thanks to the auto-da-fé of Dijon we have the reconstructed [reconstitué] hero in full. 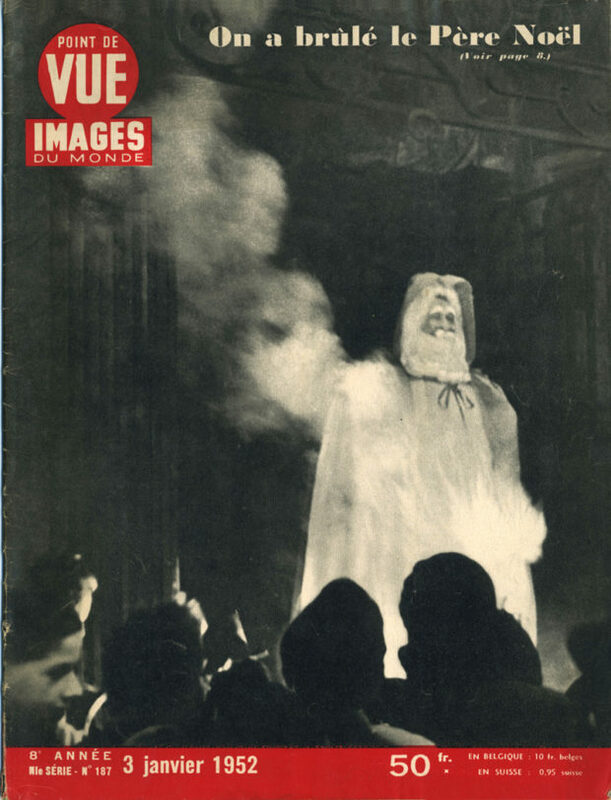 The paradox of this unusual episode is that in wanting to put an end to Father Christmas, the clergymen of Dijon have only restored in all his glory, after an eclipse of several thousand years, a ritual figure they had intended to destroy. Before it signifies the act of putting to death, “execution” means the act of accomplishing something. Through the public burning of an effigy of Father Christmas, Lévi-Strauss exposes the accomplishment of its structural function. “Dijon (Côte-d’Or), le 23 décembre 1951. Il est 15 heures quand 250 enfants mettent le feu à un mannequin à barbe blanche sur le parvis de la cathédrale Sainte-Bénigne. PHOTOPQR/Le Bien public” (image retrieved from Le Parisien). Image: Cover for Point de Vue, no. 187, January 3, 1952. France Culture (2006). 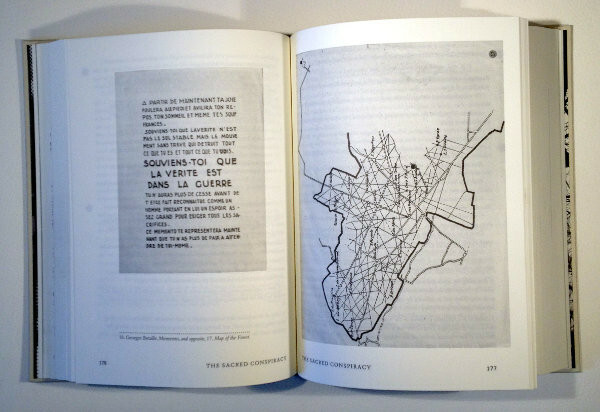 “Histoire des saints 2/4”, with audio testimonies of participants to the events of 1951, Dec. 19. Berrod, Nicolas (2018). “23 décembre 1951, le jour où le Père Noël a été envoyé au bûcher”, Le Parisien, Dec. 23. Gunthert, André (2012). «Croire au Père Noël», L’atelier des icônes. Carnet de recherches d’André Gunthert (archive), Dec. 24. Lévi-Strauss, Claude (1952). «Le Père Noël Supplicié», Les temps modernes, no. 77, pp. 1572-1590, Paris: Gallimard. Lévi-Strauss (1953). «Les avatars du Père Noël ou la psychologie des mythes», Revue des Arts et traditions populaires, avril-juin, pp. 161-163. PDF. Lévi-Strauss, Claude (2013). Nous sommes tous des cannibales, Paris: Seuil, pp. 13-47. Lévi-Strauss, Claude (2016). Le Père Noël Supplicié, with a forward by Maurice Olender, Paris: Seuil. Miller, Daniel (ed.) (1995). Unwrapping Christmas, Oxford: Clarendon Press, pp. 38-51. PDF. Where are the scratches in 2001: A Space Odyssey? Which edition of 2001: A Space Odyssey feature the scratches? There is a set of scratches in 2001: A Space Odyssey that are not on the film, but in the film. They were filmed during production, in 1965 or 1966, visible at the same moments and locations within the frame in most copies of the movie, from VHS and Blu-ray releases to 70 mm and IMAX prints. It remains unknown if they were visible during the film’s premiere in April 1968. Animated snapshots of the set of scratches are shown above. They are not the only scratches visible in the movie, but by far are the easiest to spot. They flash by the dark purple “COM” label on one of the EVA pod’s many computer screens. These scratches did not appear on a specific release of the film. Rather, they occurred on one of the many 16 mm loops of celluloid film used in rear projection to fill the computer screens with a variety of readouts. The scratches were part of the set pieces, filmed during production. This makes it possible to observe the same set of scratches at the same moments and in the same position within the frame in various editions of 2001: A Space Odyssey. In fact, they should be visible on all available copies, with two notable exceptions. This specific set of scratches is absent from versions of the movie where the sides of the film were cropped to fit television screens. Indeed, they only occur when the “COM” computer display is positioned on the far right side of the 2.20:1 frame. They are also absent from later editions of the film where they may have been digitally erased or cleaned. 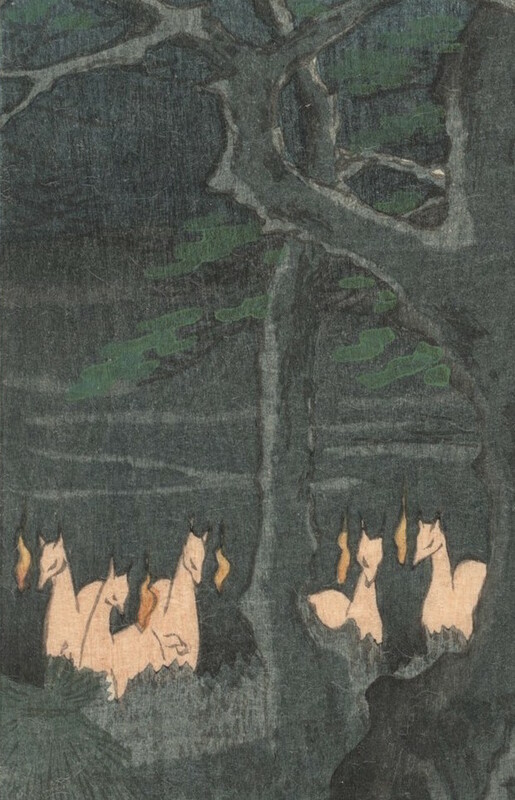 Their absence alone is not a proof of digital cleaning, but it represents a likely and partly supported explanation. The specific snapshots featured above were taken from Warner’s 2007 Blu-ray edition of 2001: A Space Odyssey. The same scratches can also be observed in a number of additional releases, including VHS and DVD editions, which I have listed in a table below. Interestingly, they are also visible on the “unrestored” 70 mm print launched at Cannes in May 2018. Each time, the set of scratches occurs at the same place, at the same moments. They only flash by when the “COM” logo appears (although not every time), and always in scenes featuring interior shots of the EVA pod’s computers. In the following research notes, I first describe when the scratches occur in the film. Then I examine various editions of 2001: A Space Odyssey, and list which carry the scratches. Finally, I provide technical information to explain how the animated readouts filling the many computer screens on the set were made. 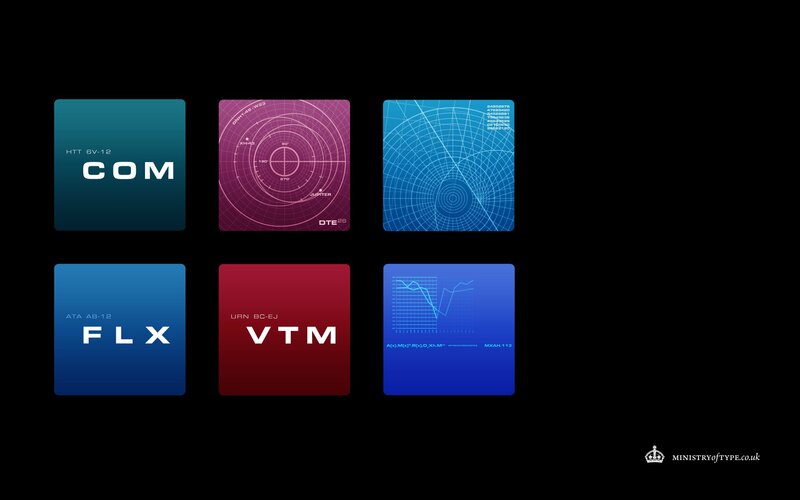 In the film, the “COM” computer display shows a variety of datasets and graphs. However, the scratches always appear when the “COM” logo replaces a readout sequence involving a zooming and then blinking wave-like graph. The fact that the scratches always appear within the confines of one of the computer displays indicates they occurred on one of the many 16 mm loops used in rear projection to fill the screens with animated readouts. Because of the color of the scratches, it is possible to infer they occurred on the emulsion side of the 16 mm film (I will explore how these readouts were produced below). Finally, there are shots featuring the blinking, wave-like graph being replaced by the “COM” logo without any visible scratches. It is possible the 16 mm loop was scratched on set, during the production of the film, or that more than one copy of some of the readout loops were printed and used. The first sequence takes place just after the intermission, which begins after the famous scene where HAL lip-reads Poole and Bowman’s discussion of their concerns about the computer inside one of the EVA pods. The intermission ends as both astronauts initiate a mission to put back the allegedly faulty AE-35 unit. To do this, Poole pilots the EVA pod while Bowman observes from Discovery’s command center. The very first image after the intermission is a wide shot of Discovery passing in the frame from left to right. It’s immediately followed by an exterior shot showing the EVA pod piloted by Poole as it emerges from behind the Discovery’s habitation sphere (often compared to the ouverture shot of the film, itself dubbed the “the occultation shot” by the production crew). Then there is a side view of Bowman inside the Discovery’s command center, as he observes Poole’s progress on the monitors. This leads to a shot of the console, where we can see what Bowman is looking at: one of the computer screens showing the interior of Poole’s EVA pod as it slowly moves alongside the Discovery1. View of the command center where Bowman monitors Poole’s EVA. The screens are labelled CM-1 through CM-8. The video feed in CM-4 shows the interior of the EVA pod piloted by Poole, including its own computer screens. CM-7 features the “COM” label along with the alphanumerical call sign “PMT: 26-07”. Snapshot from Warner 2007 Blu-ray edition @01:30:50. Cut to a frontal shot of Poole’s face in the helmet, inside his EVA pod. The lights and readouts from the computer monitors reflect on his visor. The film then transitions to an overhead shot. From above, we see the front portion of Poole’s helmet as he is pressing buttons. The bulk of the frame is occupied by the EVA pod control console: it features the various buttons and blinking readouts from all the computer screens. Six are visible: two on the left, two in the center just below the pod’s main window, and two on the right. The first screen from the right is the “COM” computer display. During the same overhead shot, a wave-like graph soon blinks on that specific screen, then disappears, giving way to the “COM” label. The first set of scratches flashes by at this moment. A set of scratches is briefly visible on the “COM” computer display. Animated snapshot from Warner 2007 Blu-ray edition @01:31:13. More than one set of scratches are clearly visible on some DVD editions. During Pod 1, the set of bright scratches is itself preceded by a linear scratch appearing twice, the second time deeper than the first. On these editions, other damage is also visible on and around the “COM” logo. However, some of that damage appears to have been cleaned on the Warner’s 2001 “Digitally Restored and Remastered” edition (where the linear scratch is visible during Pod 1, but not the set of bright scratches), as well as on Warner’s 2007 Blu-ray edition. In Warner’s 2007 Blu-ray edition, for instance, the linear scratch is not visible during Pod 1 but it nonetheless shows a detailed rendition of the bright set of scratches I discuss here. On Warner 2001 DVD edition “Digitally Restored and Remastered”, the bright set of scracthes appears to have been cleaned, but a linear scratch is briefly visible on the right side of the “COM” computer display. Animated snapshot (enlarged) from Warner 2001 DVD edition @01:32:14. In the Warner’s 2007 Blu-ray edition, it is even possible to catch glimpse of green and yellow hues at the very edge of the scratches. As I have suggested, this can indicate the scratches occurred on the emulsion side of the 16 mm film. A scratch on the base side usually leaves a black mark (often a black continuous line, such as when the film gets pinched in a guiding roller, for example). When a scratch occurs on the emulsion side, it can appear as a green mark (if only the magenta dye layer was removed) or a yellow one (if both the magenta and cyan dye layers were damaged), depending on the depth of the scratch. When all the emulsion has been removed – that is, all three dye layers have been scratched – the light passes right through the transparent base and the scratch appears onscreen as a white mark. For the second sequence where the scratches are visible, we must return to DVD editions, as they appear to have been cleaned from Warner’s 2007 Blu-ray edition. Indeed, on some other editions – including the 70 mm “unrestored” prints – the scratches are visible on three additional occasions during Bowman’s rescue mission. Immediately after witnessing Poole’s murder from the command center inside Discovery, Bowman boards a second EVA pod (leaving his helmet behind) and launches a desperate (and notoriously slow) attempt to save his companion. Inside the second EVA pod, the scratches on the “COM” loop can be observed three times between the start of the mission and the moment when Bowman makes the decision to let go of his friend’s body in order to execute his “explosive bolts” plan, after being locked out of Discovery by HAL. Throughout the mission, and in various shots, the “COM” label is still visible on the right side of the pod’s console, but in the second sequence it’s featured as the front-right computer screen, closer to the center window. Still, it runs the same two sequences: the wave-like graph and the “SLOL” dataset (as well as a “CMHK” dataset during one brief overhead shot). At five different moments during the chase, the viewer is offered Bowman’s point of view, as he tries (along with us) to locate his companion’s body in the vast emptiness of space. This shot is framed so the center of the screen is entirely occupied by the pod’s window. Only part of the front-left computer screen and part of the front-right computer screen remains visible (along with a variety of blue and yellow buttons). As mentioned, this specific shot is used five times: four times during the chase itself, and once when Bowman releases Poole’s body, watching as it floats away. Upon closer examination, it is likely that those five scenes actually feature the same shot of the interior of the EVA pod, showing only slightly different moments during the readout of the loops. In other words, the computer displays show slightly different content from one scene to another, but it’s merely a different section of the same shot being re-used. Each time though, different content is matted into the window area of the EVA pod. The first two times the shot is used, the window is empty except for stars as Bowman looks for Poole’s body. The third time, the body can be seen as a tiny yellow dot. The fourth, the body closes in and comes in full view. The fifth time the shot is used happens after Bowman fails to persuade HAL to let him in, and he decides to release Poole’s body: it floats away, becoming smaller in the pod’s window. 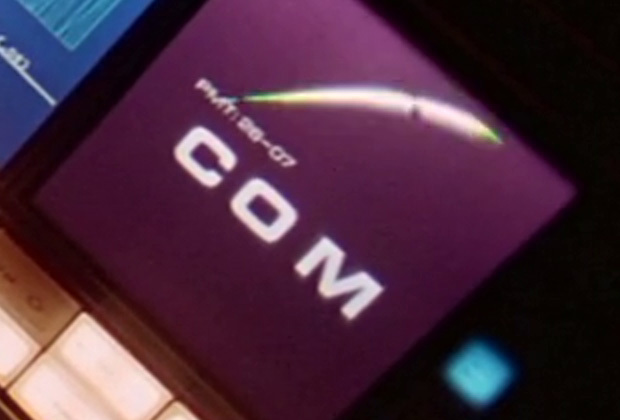 In those five scenes, the “COM” logo loops back on the computer display three times. Each time, the set of scratches flashes by, clearly visible. 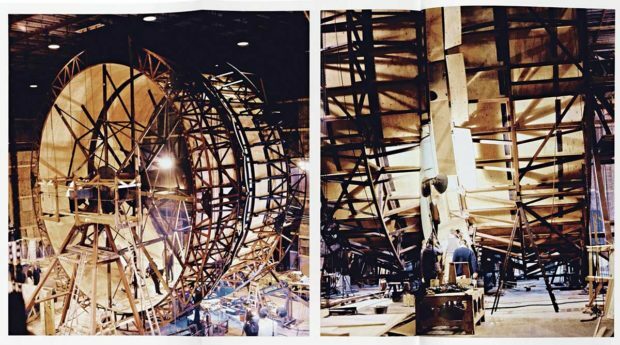 It is almost certainly the same moment of the 16 mm loop featured in the exact same shot of the pod’s interior, being re-used. View from Bowman’s EVA pod, after he released Poole’s body. The set of scratches is briefly visible on the right side, on the “COM” computer display. Animated snapshot from Warner 1999 DVD edition @01:48-48. Which editions of 2001: A Space Odyssey feature the scratches? There are a lot of different editions of 2001: A Space Odyssey. So far, I’ve been able to examine 10 different editions ranging from a 1985 VHS pan-and-scan edition all the way to the new 2018 70 mm “unrestored” print and the IMAX 15-perforation 70 mm print. A table outlining each version is provided below, indicating if the scratches are visible in the sequence involving Poole’s radar mission (Pod 1) and the sequence involving Bowman’s rescue mission (Pod 2). Since there are many different editions of Kubrick’s movie, I’ll update those notes if new information becomes available. Crucially missing from this table are reports from the laserdiscs editions (there are six of them) and the upcoming 4K UHD release (Amazon.com). On the MGM/UA Home Entertainment 1985 “pan-and-scan” VHS edition the ratio is 4:3, meaning the sides of the film were cropped. Since the set of scratches occurs on the “COM” computer display when it is positioned on the right side of the 2.20:1 frame, it is cropped out, as is nearly half of the original 2.20:1 image. Warner 2001 “Digitally Restored and Remastered” DVD edition is the only one I know of where the bright set of scratches has been cleaned in both Pod 1 and Pod 2. However, a linear scratch remains clearly visible as the “COM” label passes by in Pod 1. The dual layer PAL Region 2 (R2) DVD released by Warner in France in 2006 is likely a repackage of the 2001 “Digitally Restored and Remastered” edition. In Warner 2007 Blu-ray edition, the set of scratches on the “COM” computer display is clearly visible in Pod 1. 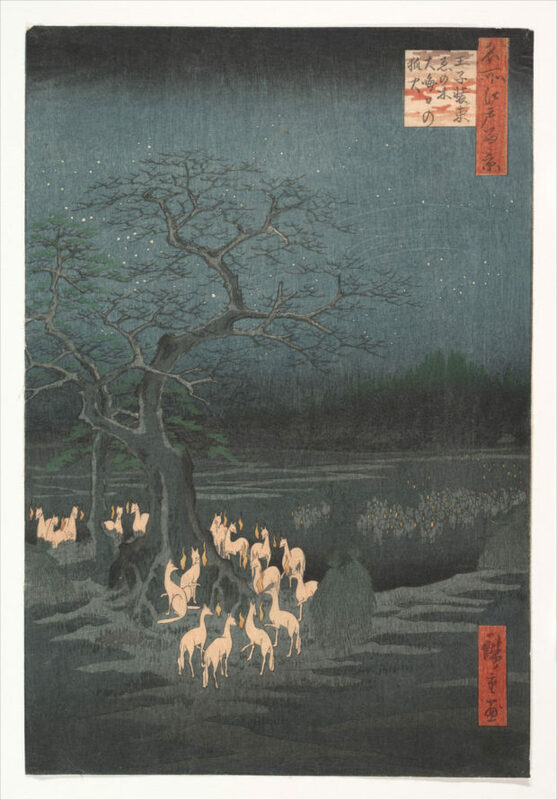 It is this version that is featured at the beginning of those research notes. The scratches however are not visible during Bowman’s rescue mission (i.e. Pod 2). The fact that the scratches are present on both missions on the 70 mm “unrestored” edition suggests that some of the original material (perhaps the original camera negative) still bears trace of them. The IMAX edition is based on Nolan “unrestored” edition premiered at Cannes in May 2018. I saw the IMAX 15/70 on August 31, 2018 at the Cinesphere in Toronto. When it comes to the making of 2001: A Space Odyssey, discussions abound on the innovative methods used to create the “Dawn of Man” sequence (with its front projection and elaborate costume designs) or the “Star Gate” sequence (with its innovative use of slitscan photography). Less attention is given to the massive task of producing all the readouts seen on the computer screens featured in various spacecraft throughout the film. Yet those readouts have quite a story to tell: some even ended up being used in the production of the “Star Gate” sequence. “2001 Communication Center” Bell Labs, 1968. Uploaded online by A. Michael Noll. The computer graphic animations would have to be done the old-fashioned way. As Douglas Trumbull recalls in Bizony’s book, “we had to make something that looked like computer graphics by using conventional film and animation techniques” (Ibid.). Today, Trumbull is a highly regarded special effects supervisor, renowned for his work on films such as Close Encounters of the Third Kind, Star Trek: The Motion Picture, Blade Runner, and The Tree of Life. Back in 1965 however, he was 23 years old and had barely started in the business of special effects, working mostly with illustrations. He first joined Kubrick and the pre-production team in England in mid-August. As it turns out, his very first assignment was the production of the many readouts seen throughout the film, and especially during the “Jupiter Mission” segment. The 35 mm Mitchell camera had been “cannibalized from an optical printer,” as Don Shay and Jody Duncan explained in the seminal article they penned for Cinefex in 2001, which to this day still offers the most detailed account of the production of those readouts (2001: 85). Unlike traditional animation, the camera was fixed, and movement was simulated using a zoom. “A lot of the readouts were generic,” further explained Bruce Logan4, the talented cameraman mentioned by Trumbull, “– nothing very carefully thought out. There just needed to be something moving on the viewscreens. Doug and I would strip up graphs and such, and then start blinking on lettering and numbers.” (Ibid., p. 85). Bruce Logan, who was just 19 at the time, would end up becoming a well-known special effects supervisor, credited (among other feats) with detonating the Death Star in the original Star Wars5. Example of graphs found in Scientific American. They were not actually used in 2001: A Space Odyssey. LEFT: Vol. 212, No. 2, February 1965, p. 99. RIGHT: Vol. 212, No. 3, March 1965, p. 60. Original caption: “The carousel-shape centrifuge takes shape. Production staff and fitters standing at the bottom of the wheel give an impression of its scale.” Retrieved from Bizony, 2015: pp. 206-207. 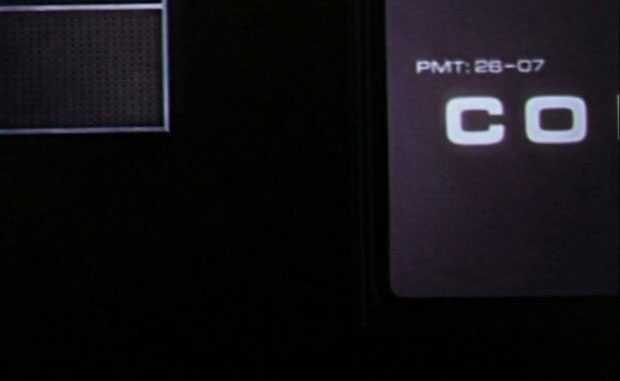 When we first see the (rear-projected) control cabin readout in the Orion shuttlecraft, it shows the spin of the station relative to the Orion. When we see the Orion and the Station lined up (through a matte shot composited with stock footage of the Orion interior), the readout is still showing the same relative motion of the craft. The “COM” display is part of a three-letter screen identification protocol along with other similar system displays, most of them using a three-letter call sign: VEH, NAV, GDE, and so on. 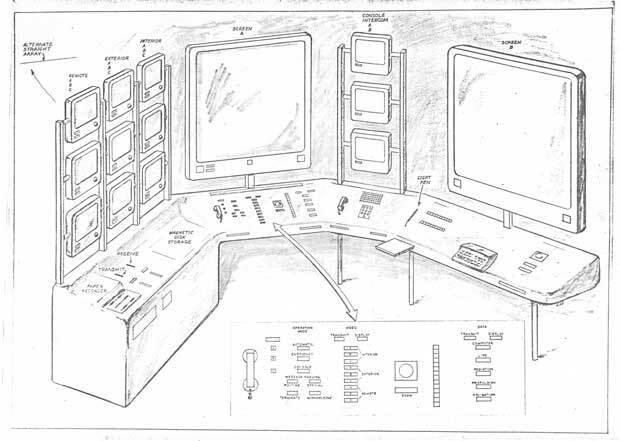 Those displays can be seen on computer screens aboard all the spacecraft throughout the film, including the Orion III spaceplane, the Aries lb lunar lander, and the Moonbus. Some of the readouts seen aboard the Discovery are also visible in various rooms of Clavius Base during the landing of Aries lb. Inside view of Aries Ib lunar lander’s cockpit. Snapshot from Warner 2007 Blu-ray edition @00:38:24. Detail of the interior of Clavius Base during the landing of Aries lb. Three screens are visible on the left: the middle one shows the wave-like graph associated with the “COM” loop. Snapshot (enlarged) from Warner 2007 Blu-ray edition @00:40:17. Inside view of the Moonbus’s cockpit. Snapshot from Warner 2007 Blu-ray edition @00:49:50. 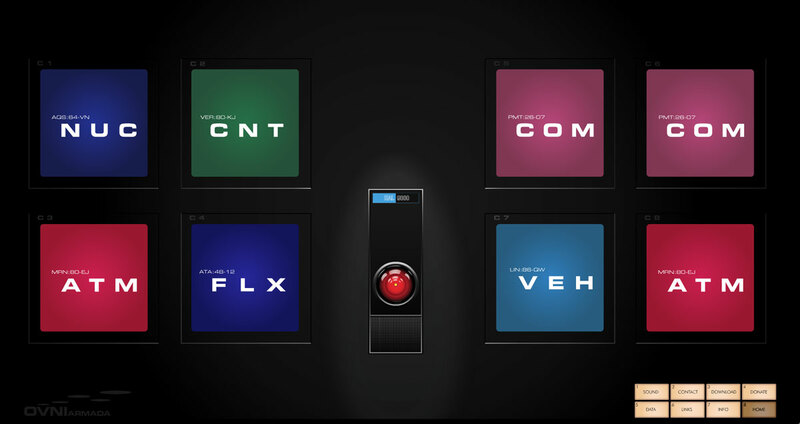 Aboard the Discovery, the “COM” computer display is part of the HAL 9000 user interface, and thus can be seen on a number of different occasions. It is featured on the main console located in the ship’s centrifuge (prominently visible in the opening shots of the “Jupiter Mission” segment). On the main console, each of the 12 visible screens is identified with a code: C1 through C12 (the numbers appear on the upper-left corner of each screen).7. A snapshot from the opening of the “Jupiter Mission” segment showing the 12-screen HAL 9000 interface in the living module (centrifuge) of Discovery. Screened are identified C1 through C16. From Warner 2007 Blu-ray @01:01:14. In the command center used to monitor EVAs – a location physically different than the centrifuge main console8– the screens that are visible are labeled CM1 through CM8. Each of those screens is theoretically capable of displaying anything, be it “COM” or something else. Aboard Discovery though, the “COM” display is always seen on the screen immediately to the left or right of HAL’s camera (C4 or C7). View of the command center showing some of the computer screens labeled CM1 through CM8. Snapshot from Warner 2007 Blu-ray edition @01:32:53. The “COM” computer display has a more important role within the Discovery, as it displays video transmissions both from Earth and cameras onboard the ship, along with pre-recorded video programs. A BBC program, The World Tonight (featuring the interview with HAL) and a message from Earth regarding the faulty AE-35 unit are presented on the “COM” display left of HAL’s camera. The birthday message recorded by Dr. Poole’s parents is also shown on a “COM” computer display embedded in the wall of the crew’s sleeping quarters in the centrifuge. The “COM” display can also play live feeds from onboard surveillance cameras, allowing both astronauts can keep an eye on each other when they take turn on EVA missions. Poole just finished watching a video message sent by his parents for his anniversary. The “COM” label is visible on the computer screen. Snapshot from Warner 2007 Blu-ray edition @01:05:53. Those feeds were an opportunity for Kubrick to further deepen the level of realism. Some of the footage seen in the “COM” display and the two “IBM Tele Pad” (as they are labelled in the film) actually feature scenes from the set itself, where onboard computer screens are visible. Thus, on some occasions, shots of scenes where computer readouts are visible were filmed and turned into 16 mm film, then rear-projected into a display to fake a live video feed. The results are a few striking “inception” displays. For example, the BBC program featured at the very beginning of the “Jupiter Mission” segment shows the two astronauts filmed inside the centrifuge alongside HAL while there are being interviewed. Some of the computer screens from the main console with their blinking readouts are visible. The sequence just after the intermission when Bowman monitors Poole from the command center while the latter is on the EVA mission to replace the AE 35 unit also features another technically stunning display-within-display. One of many occasions when 2001: A Space Odyssey features displays shown within diplays. In this example, Bowman watches a BBC program on an IBM Tele Pad. The program features shots of the interior of Discovery, including shots of the 12-screen HAL 9000 interface. Snapshot from Warner 2007 Blu-ray edition @00:59:47. When it does not provide video feeds, the “COM” computer display features a set of readouts prepared by Trumbull and Logan, as I described above. Within the Discovery, the loop first features a graph labeled “BL 78” (featured prominently during the chess game Bowman plays with HAL). While Poole plays a game of chess with HAL, the “COM” computer screen displays the “BL 78” readout. Snapshot from Warner 2007 Blu-ray edition @01:06:33. Inside the EVA pod used by Bowman to first retrieve the AE-35 unit, the loop features a dataset screen labeled “ST74.” During Poole’s EVA mission to replace the allegedly faulty AE-35 unit, the “COM” screen featured the wave-like graph (immediately followed by the “COM” label where the set of scratches can first be observed). During Bowman’s subsequent rescue mission, at least three different loops are featured. Only briefly shown on the front-right screen is a “CHMK” dataset. Another, more prominently featured graphic is the same wave-like graph seen in Poole’s EVA mission (which ended with him being murdered by HAL). A third is another dataset labeled “SLOL,” which in some shots follows the wave-like graph, after the appearance onscreen of the “COM” label (the “SLOL” dataset can also be spotted inside Clavius Base, during the landing of the Aries lb). Details of two different snapshots from scenes featuring computer displays inside EVA pods. LEFT: @01:26:06 during Poole mission to put back the AE-35 unit, the “COM” screen displays the blinking wave-like graph; RIGHT: @01:36:51 during Bowman rescue mission, the “COM” screen displays the SLOL dataset. Snapshots from Warner 2007 Blu-ray edition. Inside the EVA pod used by Bowman, each of those loops are shown in the front-right computer screen. The set of scratches appears (and occurred) on the 16 mm loop featuring the wave-like graph. After he releases Poole’s body, Bowman directs the EVA pod toward the hatch. During his approach, the “COM” screen is featured for the longest period in the film: the sequence starts with the “SLOL” dataset, followed by the “COM” label, and then the “ST74” dataset. As mentioned before, during this long sequence the set of scratches is not visible on any copy of the film. On only two occasions onboard the EVA pods, all the screens feature a special sequence, different from the usual readouts seen throughout the film. It is first shown when Bowman boards the second EVA pod to try to rescue Poole: the screens first show a common system initiation sequence. Finally, when Bowman’s EVA pod “lands” inside the chamber, after the “Star Gate” sequence, all the screens display the same “Malfunction” message. The last time the computer readouts are visible in the film is inside Bowman’s EVA pod after it has landed in the room: they show “Non Function” signs. Snapshot from Warner 2007 Blu-ray edition @02:11:36. Many questions remain about the presence or absence of those scratches. Specifically, it would be interesting to learn more about what happened to Warner’s 2001 “Digitally Restored and Remastered” DVD edition and 2007 Blu-ray edition (for instance, in the latter, why are the scratches visible in one sequence and not the others). Similarly, it would be interesting to obtain information about the various laserdisc editions, at least one of which was supervised by Kubrick at the time. It should soon be possible to confirm if scratches are visible in the new, forthcoming 4K edition as well. Further considerations will have to be developed elsewhere. For instance, what exactly are the guiding principles of restoration? To preserve the film as close to its original form? This invite discussions about faithfulness to such an original form or about the “authentic look” often mentioned in relation to recent release of the “unrestored” 70 mm edition of 2001: A Space Odyssey. It would be possible to argue there is no such thing as an “original” 2001: A Space Odyssey: indeed only interpositives (IP) and internegatives (IN) copies, and copies of copies. There might still be a single original camera negative (OCN) but it is not meant to be viewed as such, only to produce more copies. One does not watch 2001: A Space Odyssey, but watches a given copy of it. It is telling that with celluloid film, the original is called a “negative”, that it all starts with negativeness. The bright, white scratches themselves are not something we see. It is not a presence on the celluloid film, but the mark of an absence: we see the removal of all layers of dye. This removal, it turns out, further testifies of the materiality of a medium once used to simulated a digital future often perceived as being as immaterial as HAL’s disembodied voice. The stubborn persistence of this materiality into Blu-ray editions of the film further invites reconsideration about common narratives having new media replacing old ones in a clear, linear succession. 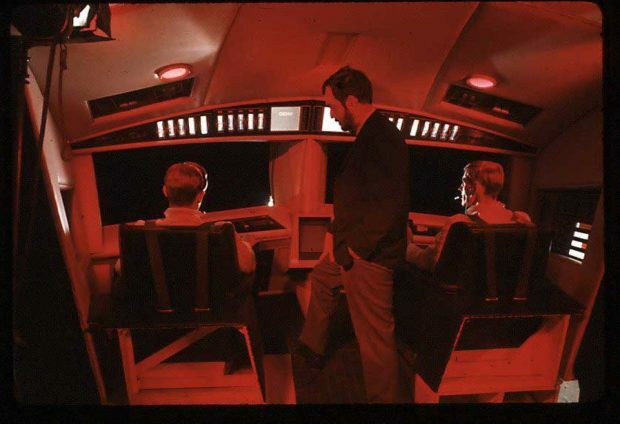 Stanley Kubrick stands inside the cockpit of the Aries lb lunar lander, the “COM” label visible in one of the computer screens just by his head. Retrieved from iamag.co. Agel, Jerome (1970). The Making of Kubrick’s 2001, 1st edition, New York: Berkley. Benson, Michael (2018). Space Odyssey: Stanley Kubrick, Arthur C. Clarke, and the Making of a Masterpiece, New York: Simon and Schuster. Bizony, Piers (2015). The Making of Stanley Kubrick’s ‘2001: A Space Odyssey’. Köln: Taschen. Bozung, Justin (2014). “2001: A Space Odyssey Interview Series: Brian Johnson”, TVStoreOnline.com, August 21. DeMet, George D. (1999). “The Special Effects Of 2001: A Space Odyssey”, 2001archive.org, originally published in DFX, July 1999. Frinzi, Joe R. (2017) Kubrick’s Monolith: The Art and Mystery of 2001: A Space Odyssey. Jefferson: McFarland. Lightman, Herb A. (1968). “Filming 2001: A Space Odyssey,” American Cinematographer, Vol. 49, No. 6, June 1968. Logan, Bruce (2016). “Working with Stanley Kubrick on 2001: A Space Odyssey,”, Zacuto.com, February 9. Morton, Jon (2014). “Starwars.com: “Bruce Logan: The Special-Effects Jedi Who Blew Up The Death Star”, StarWars.com, December 5, 2014. Noll, A. Michael(2018). “First-Hand:Bell Labs and 2001: A Space Odyssey”, Engineering and Technology History Wiki, April 25. Persons, Dan (1994). “2001: A Space Odyssey: Douglas Trumbull On Stanley Kubrick’s Science Fiction Epic”, Cinefantastique, vol. 25, no 3, June. Schwam, Stephanie, ed. (2000). The Making of 2001: A Space Odyssey, 1 edition, New York: Modern Library. Shay, Don and Duncan, Jody (2001). “2001: A Time Capsule”, Cinefex, Vol. 85, April. Stork, David G. (2000). HAL’s Legacy: 2001’s Computer as Dream and Reality. Cambridge: MIT Press. Trumbull, Douglas. (1968) “Creating Special Effects for 2001 A Space Odyssey”, American Cinematographer, vol. 49, no. 6, June 1968, pp. 416-420, 451-453. Since at least the 90s, a number of efforts have been made to reproduce the large variety of computer readouts visible throughout the film. Earlier efforts relied on low-resolution editions of the film and details had to be guessed or made up. More recent efforts, taking opportunity of higher resolution copies, provide more accuracy. The results were turned into desktop images, screensavers, animated Flash-based website, and even oil paintings. 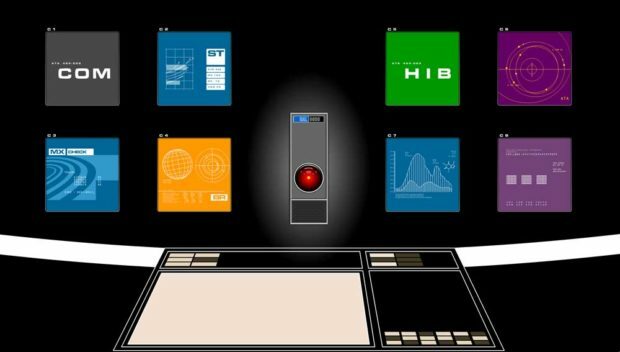 [Flash required] The HAL Project by Joe Mackenzie: “a graphic re-creation of HAL 9000, the computer from the film 2001: A Space Odyssey.” The project –the most elaborated most detailed I could find– started in 1999 and was subsequently upgraded first in 2006, and then in 2014. However, at the time of writing the project is no longer supported, likely because of licensing issues (on Facebook, the project was terminated on January 1, 2016). In its most advanced form, the project included a HAL 9000 Wallpaper Pack and a HAL 9000 Screensaver (v4.0). Free and paid editions were available. Version 4.0 of the screensaver included 84 separate animations and supported ultra-wide (21:9) aspect ratios. As of 2018, the download link for both the free and the paid versions does not work. However, previews of both the advanced and the basic edition can be examined on Daily Motion. Notice how the “COM” display correctly reads “PMT:26-07”. Snapshot from “The HAL Project” by Joe Mackenzie (as of Sept. 3, 2018). Notice the “PMT:26-07” call signe and the “C7” computer identification label (upper left corner of the computer display). Snapshot of Mike L. Jackson Flash-based reproduction of “HAL 9000: USS Discovery Interface” (as of Sept. 3, 2018). The identification label for each screen (C1 through C8) is clearly visible. The number featured on the “COM” display reads “ATA 494-503”: this is made up and it does not appear in the film. [Flash required] The HAL 9000 by Mike Dillinger “provides an interactive experience with the world of Stanley Kubrick’s 2001: A Space Odyssey”. The home page reproduced an animated version of HAL 9000’s main console with 8 screens each randomly displaying various readouts. The “COM” display correctly reads “PMT:26-07”. A preview of the screensaver can also be seen on YouTube. Along with Joe Mackenzie’s, this is one of the most detailed reproduction there is of the computer readouts in 2001: A Space Odyssey. Snapshot of Mike Dillinger’s website featuring a flash-based screensaver project reproducing HAL 9000 interface (as of Sept. 3, 2018). The “COM” display correctly reads “PMT:26-07”. Desktop reproduction of HAL 9000 interface created by Aegir Hallmundur in 2008. 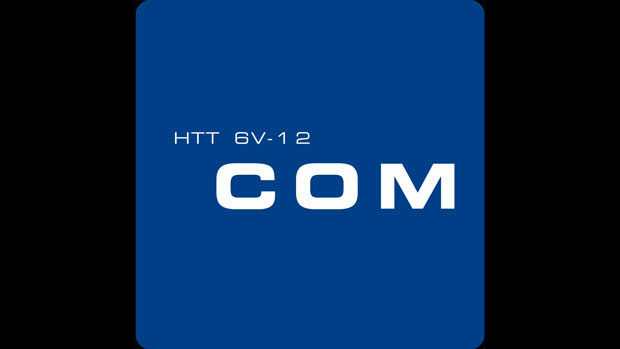 Notice the call sign on the “COM” screen reads “HTT 6V-12”. This is a made up alphanumerical number and it is not featured in the film. The “COM” readout, part of Master Replicas Group reproduction of “2001 Computer Art” (snapshot as of Sept. 3, 2018). Partial detail (enlarged) of the “COM” display featuring the alphanumerical call sign “PMT: 26-07”. Snapshot Warner 2007 Blu-ray edition @01:06:16. American artist Damian Loeb, known for his hyperrealistic paintings, painted a set of screens based on the many screens (and their readouts) seen in 2001: A Space Odyssey. He produced the series of paintings titled D-GAMA (Screens) numbered 1 through 8 was in 2003. See Mary Boone Gallery, “Damian Loeb at Mary Boone” and “Damian Loeb: Staring Into The Abyss”. Additionally, Loeb also produced a hyperrealistic reproduction of the interior of the Discovery centrifuge: “Good Afternoon Mr. Amer” (also 2003). Although not a replication project, Dave Addey writing for Typeset In The Future (which is being developed into a book) offers a close examination of typography and font choices in 2001: A Space Odyssey. Dave speculates that HAL’s own logotype diplayed in the readout “could be a manually compressed and outlined variant of Univers”. The “unrestored” edition launched at Cannes in May 2018 generated interesting discussion about the “materials” that was used and about how it was handled. The specific set of scratches discussed here, as it is not accidental to any given copy of the film but most likely an integral part of the original camera negative, could become a forensic tool to distinguish between different editions. “2001: A Space Odyssey: the backstage technology of a return to the big screen”, Official Cannes Festival website, May 13, 2018. The original camera negative and soundtrack are held at the Warner Bros archive located at the studio in Burbank. The camera negative is in good condition for its age. There is some slight colour fading, which fortunately we can correct for in printing. The negative has shrunken slightly as it has lost moisture though the normal aging process. The shrinkage has caused the negative to warp slightly and cup in the centre. The negative is handled with great care as the shrinkage will also cause the film splices to come apart. The negative has been torn in four places. We decided to leave the torn frames intact and visible in the 70mm prints rather than insert a film dupe or digitally repaired section which would be of inferior quality to the original damaged section of negative. 2001: A Space Odyssey Special Engagement in 70 mm Film, official Warner Bros. website, 2018. “Warner Bros. Pictures Celebrates 50 Years of Stanley Kubrick’s 2001: A Space Odyssey, official Warner Bros. press release, March 28, 2018. Turan, Kenneth (2018). “Christopher Nolan returns Kubrick sci-fi masterpiece ‘2001: A Space Odyssey’ to its original glory”, Los Angeles Times, May 03, 2018. Through the door to share the vision come some of the people who made it possible: Ned Price, vice president of restoration at Warner, Vince Roth, technical director at the post-production facility FotoKem, and color timer Kristen Zimmermann. Deb, Sopan (2018). “Christopher Nolan’s Version of Vinyl: Unrestoring ‘2001’”, The New York Times, May 11, 2018. Tobias, Scott (2018). “Filmworker: How Leon Vitali Learned to Stop Worrying and Love Kubrick’s Dark Moods”, Rolling Stone, May 11, 2018. Morgenstern, Hans (2018). “Filmworker’s Leon Vitali on frustrating Kubrick myths and the director’s relationship with Shelley Duval – part 2”, Rolling Stone, June 11, 2018. Even beyond Kubrick’s grave, Vitali continues to work to preserve the director’s vision. For the current re-release of 2001: A Space Odyssey (1968), Vitali color timed the 70 mm print that’s being screened in theaters. He also worked on the color timing of the 4K transfer which will be coming to home video soon. Information about film damage, workflow and structure. 2001: A Space Odyssey was shot on Eastman Color Negative film 5251 50T stock. The following documents touch on various aspect of film damage (specifically: scratches), film workflow (to understand how new prints are being struck in relation to the original camera negatives) and film structure (layers of dye). PDF: “Handling of Processed Film: Film Damage”, Kodak. Scratches are severe examples of abrasions. They physically damage the surfaces of the film and can cause the removal of a print from service. A scratch the width of a human hair will project on a 6 foot screen almost 3/4 inch wide with super 8, 3/8 inch wide with 16 mm, and nearly 1/4 inch wide with 35 mm films. A scratch is a single definite line. The interpositive is also often scanned or telecined to create the video master for home distribution. Film is made up of layers, and it’s the combination of these layers that give each film its character. Motion picture film consists of a transparent support film base, a light-sensitive emulsion, and a number of layers coated on both sides. Some layers are different from those coated on still film and are designed to help motion picture film travel smoothly through the camera. eBay, but also other similar classified advertisement websites. People often share hi-res photos of cases, tapes, and discs. One can even reach out to sellers and ask questions about a given copy. The Bibliothèque Nationale de France has a detailed listing of a number of French editions of the film. The “Distributors” section on 2001: A Space Odyssey IMDb page is quite extensive, although it lacks detail. From Visual Memory, a homage website to all things Stanley Kubrick, comes the essay “The Big Picture: 2001 on Video” by Thomas E. Brown. The essay pre-dates the release of DVD editions, but it remains the best source of information about the laserdisc editions of 2001: A Space Odyssey. Hunt, Bill (2001). “The Films of Stanley Kubrick on DVD” May 22, 2001. Tooze, Gary (2008). DVD and Blu-ray comparison, DVDBeaver.com. Finally, at the time of writing the 1968 documentary featurette “A Look Behind The Future” was available to watch online. Among other things, it features exterior footage of the centrifuge set rotating. The featurette is part of the special edition released by Warner in 2007 (both the two-disc DVD and the Blu-ray). Bonus – Found during visual examination of the film: a single typo in the title card of the BBC show The World Tonight. There is also an extra colon mark in the line just below. Detail of a snapshot from Warner 2007 Blu-ray edition @00:58:50.